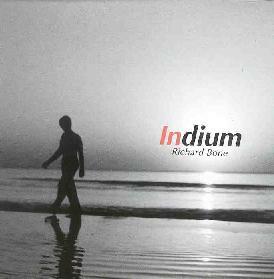 Richard Bone is an American composer and musician who has been regularly releasing albums since 1993, mostly on his own Quickworks Laboratory Discs label. The music on Indium consists of unreleased music as well as music written to be performed at Artemiy Artemiev's First International Festival of Electronic, Electroacoustic, Experimental and Avant-garde Music in Saint-Petersburg, Russia (supposed to be held in 2002 but postponed until this year). The CD opens with "Indium P-I", a 5 minute introductory piece consisting of a soft piano melody and electronics. "Indium P-II" is a 30 minute epic that opens with a spacey vibe and includes low drones, pulsating tones and sound waves, and what sounds like high speed traffic in space. Piano soon joins in with another gentle melody along with choral electronic strings. Bone does a good job of bringing together the meditative melodic and spacey avant-garde elements into a harmonious whole. After a while a repetitive keyboard pattern kicks in that reminds me of some of Manuel Göttsching's guitar creations, and the resulting atmosphere seems to draw on ambient, kosmiche, and maybe some prog rock influences. The rest of the CD consists of dreamy ambient pieces that reflect Bone's interests in accessible melodic music and more avant-garde investigations, though his real strength, and what makes Indium such an enjoyable listening experience, is his ability to seamlessly blend the two together. It's nice to have a peaceful floating journey that also provides a little something challenging for the attentive listener.